As a Studio 450 Wedding Photographer I try to capture the timeless moments that make a wedding at this New York City venue truly special. Studio 450 sits high above the streets of the city on the 12th floor of a penthouse duplex, and gives couples breath-taking views of the skyline from its windows. The space is one that provides the perfect setting for a classic New York City love story. Being a Studio 450 Wedding Photographer, I took the picture of this couple with the idea of that classic NYC love story in mind. The resulting image could be a scene from a romantic movie set in the renowned city. In the photograph, the faces of the couple are blurred and their silhouettes glow from the light of the moon that shines in the window. Adding to that golden light are the skyscrapers that dazzle and stretch up into the night sky. The blurred images of the bride and groom bring focus to the emotion of the moment, rather than the details of their appearance. 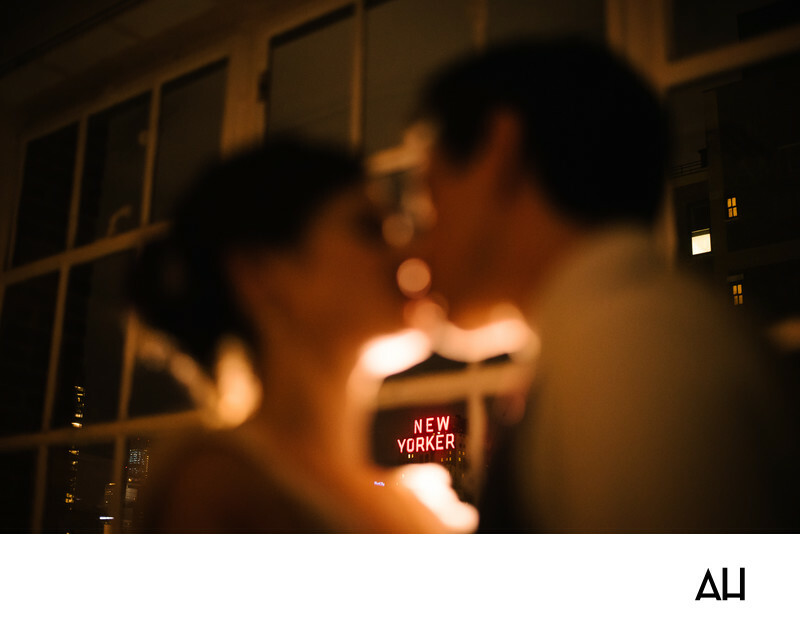 Beyond the newlyweds, a neon “New Yorker” sign lights up big in apple red. The city is an intricate part of this couple’s journey and they have spent much of their relationship amid its busy streets, so it is only fitting that they chose to celebrate their wedding day here as well. The bride and groom share a kiss with the sign glowing between them, two true New Yorkers, ready to embark on a new chapter.